All games express and embody human values, providing a compelling arena in which we play out beliefs and ideas. “Big ideas” such as justice, equity, honesty, and cooperation—as well as other kinds of ideas, including violence, exploitation, and greed— may emerge in games whether designers intend them or not. 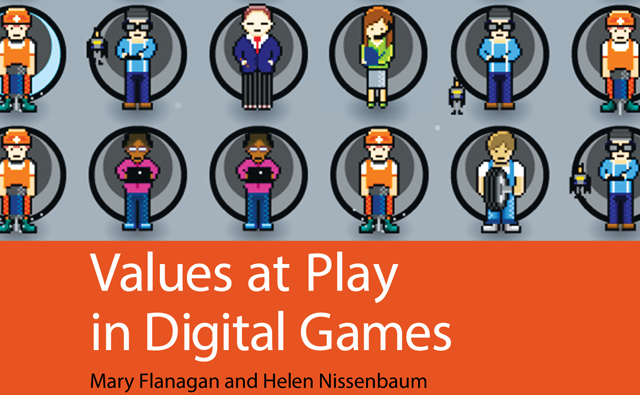 In this book, Mary Flanagan and Helen Nissenbaum present Values at Play, a theoretical and practical framework for identifying socially recognized moral and political values in digital games. Values at Play can also serve as a guide to designers who seek to implement values in the conception and design of their games. After developing a theoretical foundation for their proposal, Flanagan and Nissenbaum provide detailed examinations of selected games, demonstrating the many ways in which values are embedded in them. They introduce the Values at Play heuristic, a systematic approach for incorporating values into the game design process. Interspersed among the book’s chapters are texts by designers who have put Values at Play into practice by accepting values as a design constraint like any other, offering a real-world perspective on the design challenges involved.